If you like your slots wild and wacky then Elk Studios’ highly entertaining Taco Brothers is one you’re likely to relish. Set in 19th-century Mexico, this five-reel, 243-payline game with a fun western theme boasts excellent graphics, solid features and a genuinely funny storyline. All together now... Arriba, Arriba! 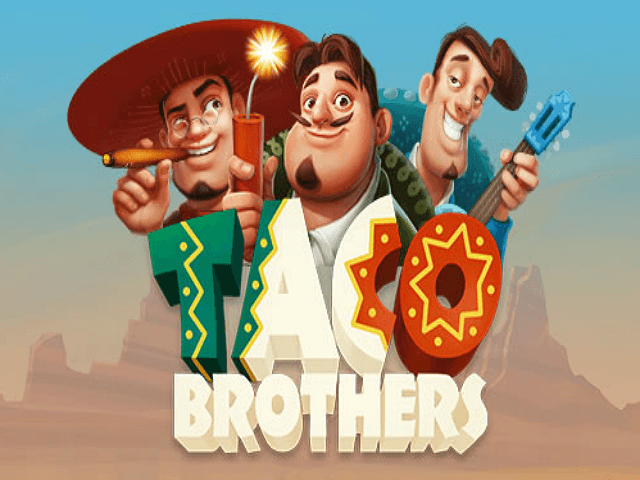 Play Taco Brothers Slot Demo for Free! Play Taco Brothers for Real Money! The light-hearted, cartoon intro sets the tone of this enjoyable game perfectly. It tells us how life in a peaceful, taco-loving village in 1880s Mexico gets turned upside down when the evil Captain Diaz arrives and steals all the tacos and pesos from the villagers. Fortunately, there are three heroic brothers – the Tacos (Pico, Pepe and Paso) – on hand who are willing to take on the dastardly captain and get the loot back. Taco Brothers’ cartoon-style graphics and silky animations are wonderful, evoking a strong sense of fun which remains throughout. The Road Runner (remember him?) inspired backdrop is a nice touch, as is the turbo-spinning fifth reel, which whizzes round so fast at times it seems like it’s going to fall off. The fiesta-esque soundtrack and audio effects are strong too, with Looney Tunes-style samples popping up at random. 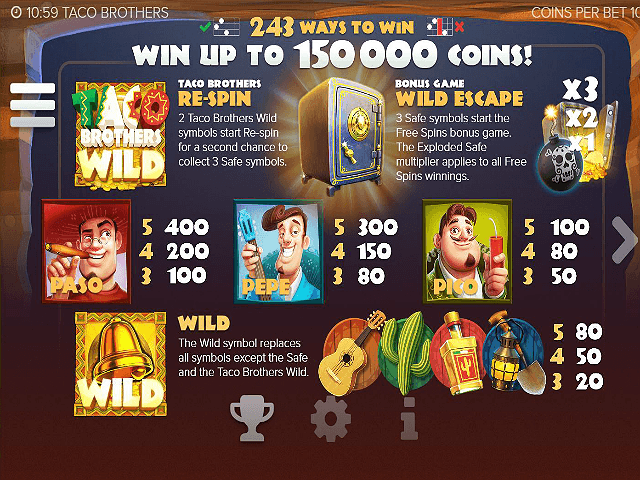 The fact that the Taco Brothers slot also features re-spins and a free spins bonus round with multipliers and running wilds is the icing on the cake. And it’s all available from 10p to £50 per spin. Captain Diaz – if the villainous captain hits then he’ll imprison one of the brothers on the reels. The round ends if all three brothers get locked up. Senorita – she may be Diaz’ daughter but the senorita is a good girl and as such she’s keen to help our heroes. If she lands then she’ll release any captured brother and grant new free spins. If two of the Taco Brothers wild symbols appear anywhere on the reels then you’ll get one re-spin of any reel that doesn’t have a safe or Taco Brothers wild on it. 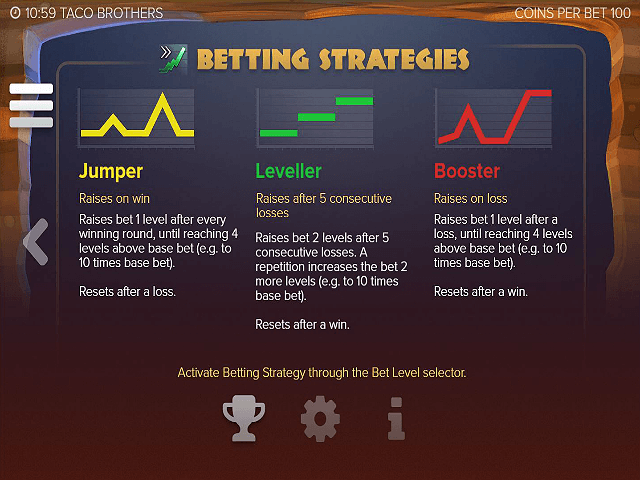 As with some other Elk Studio offerings, the Taco Brothers slot machine allows you to choose from three different betting strategies: Jumper, Leveller, and Booster. These strategies adjust your stake according to your favoured style of increasing/decreasing your wagers after losing or winning spins. 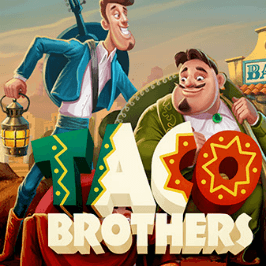 With its gorgeous visuals, engaging soundtrack and fun, well-conceived storyline, it’s clear the Taco Brothers slot game is a real charmer. The great free-spins feature is a big hit too, as is the unique Betting Strategies concept. Throw in the medium variance and it’s clear you’ve got something well worth tucking into. Ándale! Share this Taco Brothers Review today! 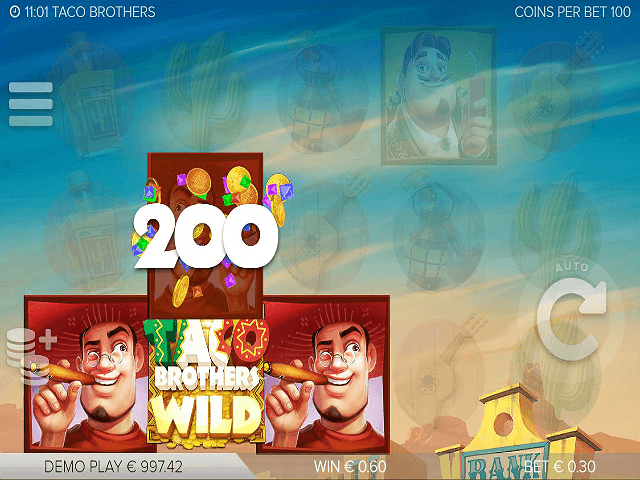 If you like Taco Brothers, you'll love these slot titles too!